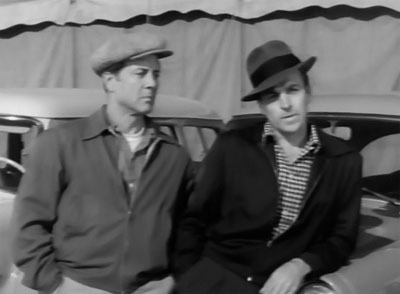 Circus acrobat Bert King (Harry Lauter) becomes an undercover agent for the Treasury Department when Art Kerr (Rick Vallin), a T-Man with whom he served in a paratrooper unit during the war, seeks his help in tracking down a gang of counterfeiters. Most of the counterfeiters’ output has been shipped abroad, depreciating American currency as part of a plot to strengthen the Soviet Union’s position in Europe. Some of the counterfeit money has also been turning up in towns played by the circus that employs Bert–which is why Art needs Bert’s assistance; the acrobat is assigned to surreptitiously investigate the circus’s personnel, and soon exposes riggers Daley (Keith Richards) and Travis (Terry Frost) as members of the counterfeiting ring. However, in order to effectively smash the ring, Bert and his trapeze-act partner June Edwards (Fran Bennett) must locate the villains’ underwater money-printing plant–and must also unmask the mysterious mastermind who gives Daley, Travis, and the other counterfeiters their orders. Like many of Republic’s 1950s serials, King of the Carnival assigns its villains a grandiose master plan that winds up seeming ludicrous due to the chapterplay’s low budget; here, we’re presented with a gang that’s allegedly plotting to disrupt the international economy, but can only afford the services of a single engraver and a pair of circus roustabouts. As in so many of his other serial scripts, writer Ronald Davidson should have scaled down his villains’ ambitions; the heavies in Carnival would have seemed a lot less laughable had they simply been presented as ordinary counterfeiters. However, while such an alteration would have made the villains seem more credible, Carnival’s storyline would still have come off as decidedly thin. Once Daley and Travis are exposed in Chapter Two, most of the action in the ensuing chapters revolves around Bert’s attempts to investigate the villains’ beachfront cave hideout (from which they access their underwater counterfeiting base), and around Daley and Travis’s efforts to kill Bert before he can find out too much. As Bert doesn’t succeed in discovering the cave’s full significance until Chapter Eleven, and since the Daley/Travis duo (obviously) never succeeds in doing away with him, the constant skirmishing between hero and villains seems even more fruitless and pointless than many similar struggles in other 1950s Republic serials–since at least most of those outings gave their characters some concrete incidental goals to achieve (stealing or protecting valuable equipment, kidnapping or rescuing secondary characters, committing or preventing acts of large-scale sabotage, et cetera). 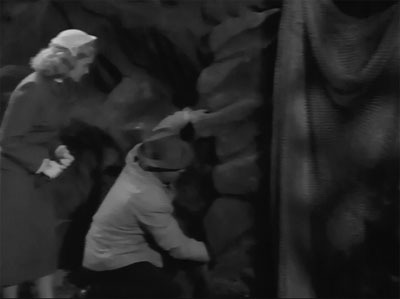 Above: Fran Bennett and Harry Lauter search the counterfeiters’ cave, and disarm a booby trap left by the ever-optimistic but luckless villains. The heroes’ discovery of the counterfeiting ringleader’s secret radio wavelength in the second half of the serial, and the ensuing attempt to locate said ringleader (who’s revealed to be broadcasting from within the circus) briefly promises a change of plotting direction–but this story avenue is soon abandoned in favor of more trips to the beach cave, once it’s provided an excuse for a fight, a flashback sequence, and an attempt to trap Daley and Travis that (of course) fails. When the boss of the counterfeiting gang is finally exposed, the scene comes off as basically an afterthought–since there’s been so little focus on the “riddle” of the mystery villain’s identity, and since the guilty party has already come under heavy suspicion in the preceding chapter (the screenplay also presents only one viable suspect, which diminishes the impact of the unmasking scene even further). Above: The mystery villain, disguised as a clown, takes direct action for the first and only time in the serial (prior to his unmasking). 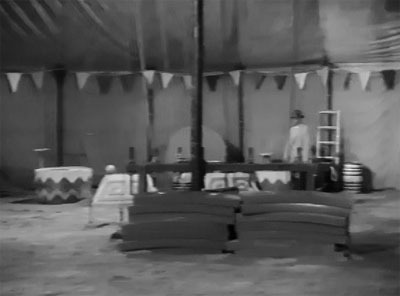 Carnival’s screenplay makes almost no use of the serial’s potentially interesting big-top setting; the circus shuts down for the winter after the first episode, leaving characters to merely discuss strategies or fight each other in its empty tents. Before the winter shutdown, however, the serial does give us a pair of impressive trapeze act over an open lion cage (the second of which provides the basis for Chapter One’s genuinely exciting cliffhanger); most of the footage involved here is derived from the 1937 Republic feature Circus Girl–but, as per the Republic norm, is fitted quite slickly and seamlessly into the serial. The only other piece of carnival derring-do in the serial is the high-dive sequence–and the ensuing fire scene–from Daredevils of the Red Circle, which provides a good piece of mid-episode action in Chapter Seven. Aside from these two borrowed acrobatic acts, a short Chapter One scene with a sideshow barker, a brief clash with a villainous knife-thrower in Chapter Three, and the use of a clown mask by a killer in Chapter Ten, the serial’s story presents no elements that couldn’t have been as easily found in a standard Republic G-man serial. 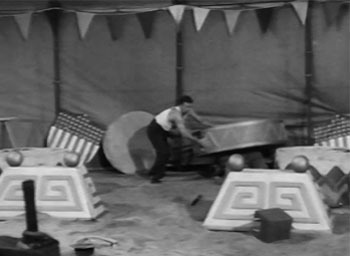 Above: Harry Lauter under the empty big top. The counterfeiters’ underwater hideout (a submerged but watertight boat) furnishes Carnival with some additional novelty value, but the frequent and overlong scenes of diving-suited heavies trudging to and from the hideout soon wear out their welcome. However, the underwater angle also allows for several action scenes set on the beaches and coastal roads of Santa Barbara–scenes which boost the serial’s visuals considerably, providing welcome relief from the drab canvas interiors featured in the various circus sequences. Republic’s backlot provides most of the serial’s other locations–including the studio’s familiar ranch buildings and the equally familiar backlot cavern-mouth area. Above: Keith Richards comes ashore with a shipment of counterfeit money. Many of Carnival’s fistfight scenes are reasonably well-done and even lively on occasion. Dale Van Sickel can be spotted doubling star Harry Lauter in a couple of fight sequences, but Lauter seems to perform the bulk of his own stuntwork–as do action heavies Keith Richards and Terry Frost; all three actors can be clearly spotted throwing their own punches and doing their own leaps and flips in most scenes. The Chapter Two fight between Lauter, Richards, and Frost inside the big top is a particular standout, with the combatants making some unorthodox and entertaining use of a couple of outsize circus drums; the Chapter Four cave fight, the Chapter Seven fight scene (which begins in an alley and leads into a warehouse), and the Chapter Eight circus-tent fight between Lauter and Lee Roberts are all solidly handled as well. Above: Harry Lauter flattens Terry Frost with one drum (left-hand picture), only to have Keith Richards launch himself at him by means of another drum (right-hand picture). 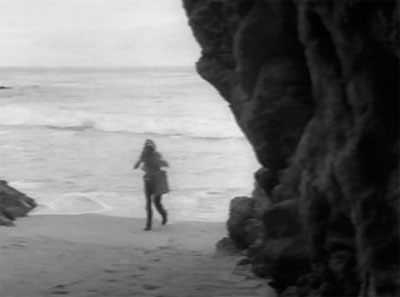 Most of the serial’s various gunfights are well-shot and well-staged by director Franklin Adreon and cameraman Bud Thackery, particularly the one on the beach in Chapter Six, the one outside the cave in Chapter Eleven, and the one on the beach and on the adjacent cliffs in Chapter Twelve. However, all of the gunfights (except the Chapter Twelve one) suffer from the same serious flaw found in practically all 1950s Republic serials: nobody is able to hit anything, since the supply of villains is so limited that the hero can’t afford to kill any of them until the last episode. The extended underwater grapple between Lauter and Gregory Gay in Chapter Eleven is interesting, but by its nature extremely slow-moving. 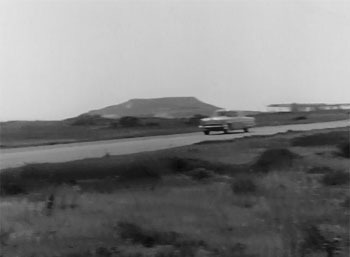 The Chapter Three car chase along a seaside road is quite good, as is the car/motorcycle chase (partially composed of stock footage) in Chapter Nine. Above left: The hero’s car zips along a shore road, in pursuit of the heavies. Above right: Keith Richards fires at Harry Lauter from a cliff as the latter battles Terry Frost down on the beach. The Chapter Nine chase culminates in the motorcycle-off-the-cliff chapter ending that originated in Federal Operator 99; other episodes trot out a stock-footage car crash, the oft-used Republic barn explosion, and the frankly overused paint-factory explosion from G-Men vs. the Black Dragon. The best cliffhanger (already referenced above) is the fall into the lion cage that concludes Chapter One, a scene that combines stock and new footage to create a memorable chapter ending. 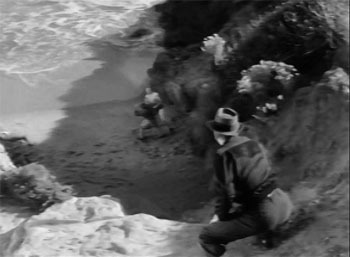 The serial also features a fair share of effective but routine all-new cliffhangers–among them the Chapter Three cave explosion, the railroad-tracks ending of Chapter Four, Chapter Six’s underwater mine cliffhanger (rather unbelievably resolved), the Chapter Seven fall against the high-voltage panel, and the hero’s imperilment by a severed air hose in Chapter Eleven. 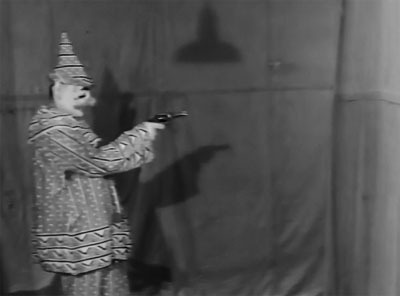 The most distinctive of these small-scaled new endings is the Chapter Ten one, in which a skulking clown appears to fire a fatal shot into the hero’s tent. 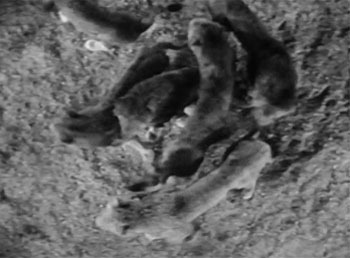 Above: Our hero seemingly drops towards the hungry lions at the end of Chapter One. The cast of King of the Carnival is a capable one overall, but none of its leading members deliver particularly lively or memorable performances. Harry Lauter is properly tough and likably good-natured as the hero, but looks a little too slow and bulky to be entirely believable as a circus acrobat, and is also noticeably less energetic than in his earlier starring serial Trader Tom of the China Seas; he comes off as almost somnolent at times, particularly when outlining investigative strategies. Leading lady Fran Bennett (a former beauty-pageant winner whose Hollywood career was a brief one) is very good-looking, possesses a pleasant Texas drawl, and is given more to do than many 1950s Republic heroines–but her lack of acting experience shows; she delivers most of her lines in blank and listless style, rarely managing to seem more than mildly interested in what’s going on around her. 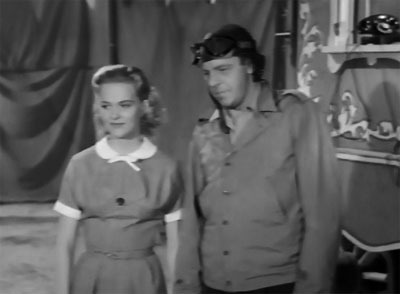 Above: Fran Bennett and Harry Lauter. The grim Keith Richards and the gruff Terry Frost (in one of his only non-Katzman serials) do a serviceable but rather unmemorable job as the serial’s action heavies; the plot gives them no chance to indulge in the violent viciousness or triumphant sneering that distinguished the best serial henchmen, and they resultantly wind up seeming like a pair of disgruntled working stiffs. Richards’ laid-back, slyly sardonic manner might have been threatening when paired with vicious actions, but isn’t at all scary by itself; the perennially aggressive Frost is somewhat more energetic, but still isn’t able to make his character’s series of irritated grumbles very menacing. As for their mysterious leader, he never manifests himself as anything other than a blandly authoritative voice on the radio. Above: Terry Frost (left) and Keith Richards. 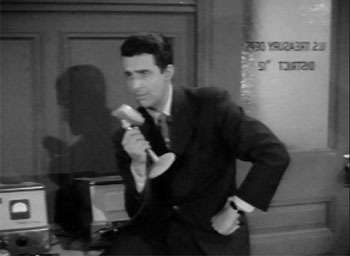 Frost’s fellow Katzman stock-company member, Rick Vallin, makes an unexpected Republic appearance as the T-Man who gives the hero his assignment and subsequently supervises his activities; he turns in a characteristically businesslike but affable performance, and establishes a good easygoing rapport with Lauter. 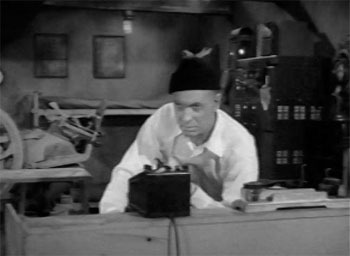 As the villains’ engraver Zorn, the sinister Gregory Gay is wasted in a role that allows him to do little but sit inside the submerged boat, repeatedly remind his cohorts of the need to destabilize the European economy, and give his lines the benefit of a Russian accent that make his character’s country of origin very obvious, even though (as in all Cold War serials) the words “Russia” or “Soviet Union” are never actually uttered. Above left: Rick Vallin. Above right: Gregory Gay. Robert Shayne is briskly benevolent and sharply stern by turns as circus proprietor Carter, the hero and heroine’s employer. 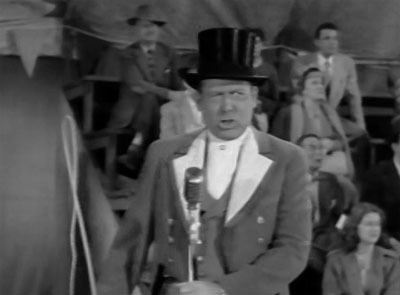 His extremely self-assured performance only falters when he’s required to deliver a flamboyant ringmaster’s speech in the first chapter; he’s simply too sober and down-to-earth an actor to pull it off with proper flair (he appears to be rolling his eyes embarrassedly as he forcedly rolls out the word “liiiiiions”). Clean-cut former RKO contract player Robert Clarke (oft-seen as a supporting actor in that studio’s post-war Tim Holt B-westerns) makes several appearances as a helpful T-Man, while Lee Roberts is so energetic in a short-lived turn as a cranky and shady roustabout that one wishes he’d been given one of the action-heavy roles instead. 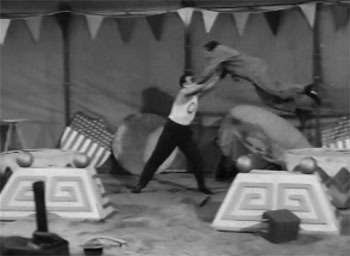 Stuntmen Eddie Parker and Bert LeBaron play other roustabouts in the first chapter, appearing long enough to participate in a fight scene; their fellow-stuntmen George DeNormand and Tom Steele appear briefly as–respectively–a murderous knife-thrower who engages the hero in a short fight and an escape artist who teams with the hero for a carnival act. Mauritz Hugo is entertaining in a bit as a shifty barker, and Richard Alexander is one of several silent roustabouts who periodically wander in and out of the big tent in order to provide token red-herring activity; Bill Scully does similar duty throughout as a lurking clown. Future star Stuart Whitman pops up in the first chapter as Harry Lauter’s acrobat understudy, who’s endangered by a cut trapeze rope intended for the hero and subsequently rescued by Lauter and Fran Bennett–a small but noticeable role. 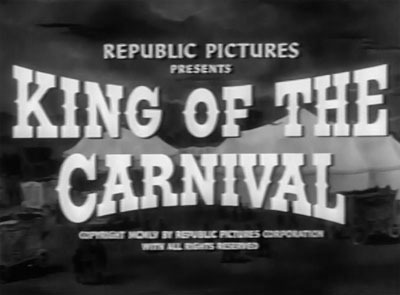 King of the Carnival was Republic Pictures’ final serial, and one could make a good case for it as the studio’s weakest. Many of the other outings from Republic’s last few years of serial-making were almost equally lackluster in terms of plotting–but were variously boosted by exotic settings, science-fictional gimmickry, charismatic stars, or strong villains; Carnival lacks any such assets, and resultantly comes off as a pretty threadbare affair. Its frequent outdoor shooting, some fine action (both old and new), and Republic’s compact post-war episode runtimes keep the serial from falling completely flat and make it easy enough to watch, but it’s still unsatisfactory–both as a serial, and as a capstone to Republic’s nineteen years of chapterplay production. Above: Robert Shayne tries to make his circus sound exciting. This entry was tagged Franklin Adreon, Harry Lauter, Republic serials, Richard Alexander. Bookmark the permalink. Not a barn burner by any means but given the understanding that economics had changed so much I appreciated its better moments and forgave the lesser ones. When I watch these latter day Republics they look like tv shows of the same period and bear scant resemblance to the Golden Age efforts, but this was true for many film in the 50’s. After the sumptuous horror banquets of Whale and Browning we got to watch Hammer Film’s Peter Cushing schlepping around in the woods as Frankenstein’s monster. Insufferable, but economics rules. Richard Hurst’s “Republic Studios” reprints some operational results for Republic and it looks like income was only around 2% of sales from ’47 on and then there were two huge losses in ’57 and ’58. I’m surprised they stayed in production with results like that. I wonder how many shareholders Republic had? There was only around $1M a year available for dividends assuming no reinvestment. I actually don’t mind KING OF THE CARNIVAL, I like it better than several previous serials like JUNGLE DRUMS OF AFRICA, MAN WITH THE STEEL WHIP, and PANTHER GIRL OF THE KONGO.